Christmas ranks second among the three greatest feasts of the Christian year, the first being Easter, the third being Pentecost. No one knows the time of year when Jesus was actually born. Since the early fourth century, the Western Church has commemorated the Nativity in late December, possibly to replace pagan festivals of the time. But over the millennia, the beauty of the Gospel account of Christ’s birth has left a lasting mark on the human soul. For families especially, Christmas can be magic and an intimate joy. It resonates with the renewal of hope that comes with each new infant family member. Christians — in other words, followers of Jesus Christ — celebrate December 25 not as just another secular holiday, but as the birthday of the messiah; the birthday, in the words of St. Leo the Great, of life itself. We live in a special time of joy every Advent and Christmas, and it has very little to do with holiday sales. Jesus Christ is Emmanuel — “God with us.” Sharing presents with friends and family is a wonderful tradition that springs eagerly from our Christmas celebrations. But the noise and distraction of mere things should never drown out the quiet voice of God’s love-made-flesh in the birth of Jesus. Bethlehem, for each of us individually and the world as a whole, is the beginning of something entirely new and utterly beautiful if we ask God for the purity of heart to possess it. The world we know today is not so different from the world of the first Christmas. Violence, greed, indifference, hatred, refugees, the struggle for power and the oppression of the poor: Despite our best efforts, these are chronic evils for a fallen humanity. Yet, the reality is this: God loved us enough to send us, through the faith of Mary and Joseph, his only Son. He loved us enough to take on our poverty, our indignities and fears, our hopes, joys, sufferings and failures — and to speak to us as one of us. He became man to show men and women how much God loves them. He was born for that purpose. He lived for that purpose. He died and rose again for that purpose. Jesus is Yeshua, which means “God saves.” When Jesus later preaches in his public ministry that “I am the way, the truth and the life,” he is only restating the miracle that begins in Bethlehem. Our redeemer is born in a stable; he is born to deliver us from sin and restore us to eternal life. This was the meaning of the birth on that first Christmas. It’s never too late to invite the Christ Child into our hearts. Surely this tired, divided and suffering world never needed him more. So this year and every year, may God grant all of us the gift of welcoming Jesus into our hearts this Christmas and throughout the coming year. 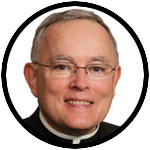 Listen to Archbishop Chaput’s Christmas message, in audio, here. Thank you to my favorite writer! Can’t wait for you next book to be released! Thank you for this glorious message of love, peace and joy. I have sent this to everyone in my family !